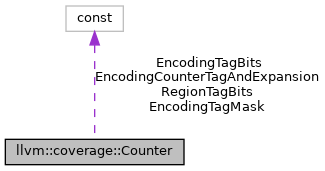 A Counter is an abstract value that describes how to compute the execution count for a region of code using the collected profile count data. Definition at line 90 of file CoverageMapping.h. Definition at line 91 of file CoverageMapping.h. Definition at line 132 of file CoverageMapping.h. Referenced by llvm::DenseMapInfo< coverage::CounterExpression >::getEmptyKey(), and llvm::DenseMapInfo< coverage::CounterExpression >::getTombstoneKey(). Definition at line 112 of file CoverageMapping.h. Referenced by llvm::coverage::CounterMappingContext::dump(), encodeCounter(), llvm::coverage::CounterMappingContext::evaluate(), and llvm::DenseMapInfo< coverage::CounterExpression >::getHashValue(). Definition at line 138 of file CoverageMapping.h. Definition at line 114 of file CoverageMapping.h. Referenced by llvm::coverage::CounterMappingContext::dump(), encodeCounter(), llvm::coverage::CounterMappingContext::evaluate(), and llvm::coverage::CoverageFilenamesSectionWriter::write(). Definition at line 106 of file CoverageMapping.h. Definition at line 129 of file CoverageMapping.h. Definition at line 110 of file CoverageMapping.h. Referenced by encodeCounter(), and llvm::coverage::CoverageFilenamesSectionWriter::write(). Definition at line 108 of file CoverageMapping.h. Definition at line 120 of file CoverageMapping.h. Definition at line 124 of file CoverageMapping.h. Definition at line 116 of file CoverageMapping.h. Definition at line 94 of file CoverageMapping.h. Definition at line 92 of file CoverageMapping.h. Referenced by encodeCounter(), and llvm::coverage::CoverageMappingWriter::write(). Definition at line 93 of file CoverageMapping.h.